Good breeze and good sea, again “Captain George” here inviting you to visit the beautiful beaches of the island of Culebra and sail its surroundings. 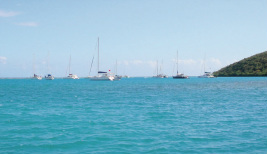 While visiting Culebra, I recommend sailing to areas like Dákity. Going in from Ensenada Honda you will fi nd Dákity, where you can anchor in calm turquoise waters that render it unforgettable. First, it’s important to look for buoys of anchorage. They are part of a system we use to anchor a boat without necessarily touching the bottom. If there are none, look for an area where you are sure you can anchor without harming the sea bottom because the ecosystem’s deterioration impacts the natural habitats of marine species that are unique in the world. Destinations that you should sail to are the island of Culebrita, which has lots of areas to explore and the stunning Cayo Luis Peña. These areas are recognized for their ecological value and the beautiful experiences you encounter while diving, snorkeling, swimming and exploring their exotic fauna and flora. These are just some of the attractions we sailors look for when we arrive to these surprisingly clear waters that invite us year round and bring us peace, quiet and tranquility. However, we should always protect the sea bottom in Ensenada Honda, Culebrita, Cayo Luis Peña and anywhere else you plan to anchor during your visit to Culebra because it’s a very special piece of paradise. Let’s protect this island’s waters making sure not to spill any liquid or solid waste. I bid you farewell the same way I started, “good breeze and good sea”. I’ll wait for you in Culebra so you’ll enjoy one of the best destinations in the Caribbean.